The CVLab Accelerator program is an intensive 4-month study in Consciousness, Customers and Capital. That is, building a foundation of purpose for your business, and helping you to develop no-nonsense customer acquisition capabilities. We will then align you with like-minded sources of capital. Many accelerators spend what we think is an inordinate amount of time prepping their entrepreneurs for the investor demonstration or “Demo” Day. While we value practice and preparation we think smart investors will get just as excited about a business model validated by real customers as they might be about a real slick presentation. Our investor day will be about demonstrating traction. We’ll work with you to drive customer validation, not just to create a pretty presentation. We think our investors will like that! The ethos of Conscious Venture Lab® will be one of “Visionary Pragmatism”. Our curriculum is built to get conscious companies to “launch velocity” within a 4-month period by focusing on Consciousness, Customers and Capital. That is, creating conscious leaders and business models, helping them develop no-nonsense customer acquisition capabilities and preparing them to attract new investment capital upon graduation. $25K – $50K in return for 5-10% Equity provided by our sister company The Porter Group and our associated Venture Capital Fund. The fund may also commit an additional amount for teams successful at attracting capital through after our “anti demo-day”! As a part of the CVLab family you’ll be connected to a worldwide community of entrepreneurs, executives, mentors, partners and investors. They’re be helping you along your way during your stay and connecting with you to support you as you grow. All sharing and helping us build a focus on the transformation of capitalism. The brain trust, these partners work with us to develop and administer the curriculum for the transformation of capitalism. Our pipeline partners help us identify teams looking to build companies that matter by sharing the opportunity to apply to the Lab with the best entrepreneurs. They are also invaluable resources after your work at the Lab is complete. These are the leading thinkers, those who inspire us and teach us. The inspiration and contributors to the David B. Wolfe Institute for Conscious Entrepreneurship. In our CVLab community you can find partners who provide a variety of services supporting any entrepreneurial endeavor. The thesis of the curriculum; Consciousness, Customers and Capital, will progress over a 24 week period. The first half of the curriculum will focus on education about conscious capitalism and the stakeholder business model and then developing a well thought out business model using this foundation as the lens for decision making. The 2nd half of the curriculum will focus on product / service development, customer acquisition and specific issues, processes and procedures based on each company’s tactical and strategic maturity. We will interject seminars on culture and leadership across multiple weeks to keep these issues foundational and top of mind. 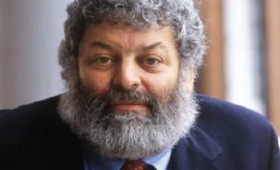 Introduction to conscious capitalism and the stakeholder model. Stakeholder engagement and stakeholder mapping. Strategy mapping and value propositions. We believe capitalism is in a state of crisis. Too many companies treat employees simply as costs to be managed, customers only as a source of cash to be extracted for shareholders, communities as problems to be avoided and suppliers as servants and not partners. Many only focus on the adverse impacts their actions have on our communities if they’re uncovered by the public or the media, and they turn a blind eye to horrible working conditions they help create in the factories of their suppliers in the name of minimizing costs. But the notion that business needs not be concerned with matters of community other than maximizing profits for shareholders is no longer acceptable in our society. In fact, authentic, transparent and soulful engagement of stakeholders is becoming a “must have” core capability for true financial success. We are evolving as a society to a point where the old shareholder-centric model of capitalism doesn’t serve us as customers, employees, communities, partners and even equity or debt holders. We understand that how we make money is just as important as how much money we make. We have come to believe that providing useful goods and services at reasonable prices is important, but not more so than addressing our collective challenges and taking responsibility for the myriad impacts business can have on society at large. According to the Website of Conscious Capitalism, Inc Conscious Capitalism® “is a philosophy based on the belief that a more complex form of capitalism is emerging that holds the potential for enhancing corporate performance while simultaneously continuing to advance the quality of life for billions of people.” The stakeholder-focused model of conscious entrepreneurship represents a clear evolution in how we might think about capitalism. At the Conscious Venture Lab we will help you build a company that matters! Strong team: A single entrepreneur is less likely to be selected than a team of at least 3. A clear idea of how you can scale your business. Focus on a large market. Demonstrated ability and temperament to be coached. Traction: Although we are focused on start-ups, businesses with any customer traction are preferred. Must be willing to be in Columbia MD for the periods of time required by the curriculum. We love social entrepreneurs but we also look for any business that wants to make the world better by elevating the humanity of your stakeholders. 3 Minute video your team, your idea and what it means to you to build a company that matters. A clear understanding of your social impact or how your company will benefit all its stakeholders.m. Clear idea on how you will benefit from the program and a demonstrated willingness to become a part of the CVLab Community. 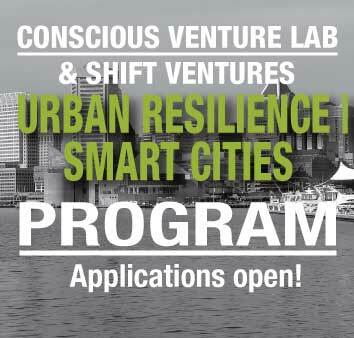 Applications are open for the 2019 Conscious Venture Lab® cohort – Urban Resilience and Smart Cities.